Yes Burger was one of the first burger spots in Prague. 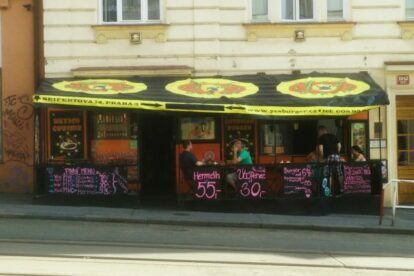 Located near the University of Economics in Prague the burgers are very cheap and high quality. For me, as a student of the university nearby, it was quite difficult to resist. For everyone else Yes Burger might be a little bit off the track. On the other hand they are opened 24/7 so if you are hungry after a few beers and staying around this area you can always grab something to eat there. The menu is huge and besides burgers they have also Mexican tortillas and tacos so it is always kind of a struggle to choose something. After having tried most of the menu I can recommend the Elvis burger, which is a burger with fried egg and coleslaw in it and it will just blow your mind. Or if it’s before payday I choose one of the burger menus which is approximately the same price as in McDonald’s, just way more delicious. There is another Yes Burger a little bit more in the center, but I tried it once and found it a completely different story, it’s probably just some franchise spot. So if I can advise you and you are not too far go to the original one. By the way the interior is full of different collections of kinder surprise toys or car models which makes it feel more intimate.